As I mentioned earlier this week, Priscilla of Boston will be closing it's doors as of December 31st of this year...forever. 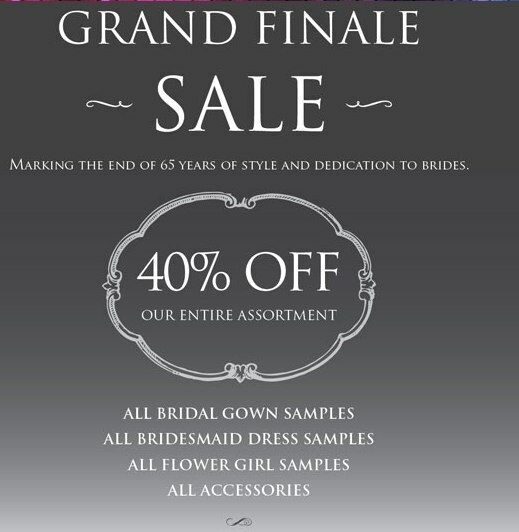 After 65 years of awesome dresses, the store is going out with a bang. 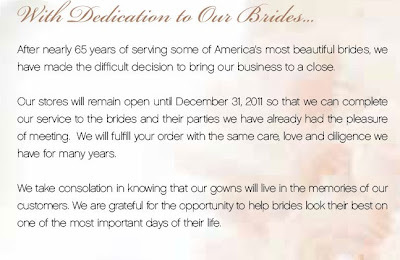 It's being shut down by it's parent company to focus on the ever-hated...I mean...whatever - to focus on David's Bridal whose overwhelming success with their Vera Wang line has made it the clear line and stores to focus on. And I mean, the line is gorgeous -- I fell in love with one of the bridesmaids dresses but if you've ever seen a Priscilla of Boston dress...well, you get the picture. The company said it will fulfill dress orders that have already been placed. 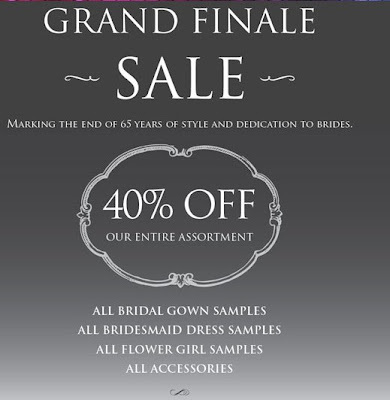 It will also continue to sell the sample dresses in the stores, but it will not take new orders for custom dresses. OneWed couldn't have said it better. We've always adored the gowns created by Priscilla of Boston, and can't say we're ready to see this brand go. But on the bright side, for 2011 brides wearing this designer, there will be an extra bit of nostalgia attached to their walks down the white aisle. And after Priscilla of Boston brides have said their I Do's, they can hold onto their gowns until they're bona fide heirlooms, and pass them down to future generations or resell them to deserving future brides. Just found out via email from my dad (hi dad!) that my mom's wedding dress was a Priscilla of Boston!! !